Christ is always present whenever we gather in his name. 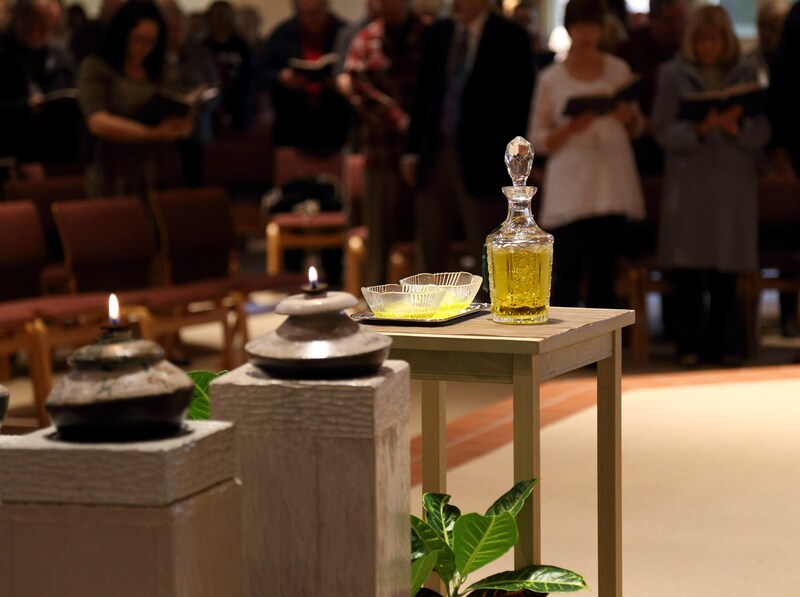 In the Sacrament of Anointing we welcome Christ as our healer. We pray that the sick may be restored to health by the gift of his mercy and made whole in his fullness. The Anointing of the Sick is the sacrament in which the priest prays, lays hands and anoints the sick person with blessed oil in the name of the whole church. Anyone who is seriously ill due to sickness, injury or old age may be anointed. The sacrament is intended for serious mental or emotional illness as well. The Rite states clearly that a person should be anointed at the beginning of illness or before surgery. The sacrament may be repeated if the recipient suffers from a different illness or injury or if the same condition becomes more serious. Elderly people may be anointed if they have become weakened by age, even if there is no serious illness present. The Anointing of the Sick may be received several times in a person’s life. It may be celebrated in the home or hospital when the priest visits, or with family and friends present to pray with the priest on behalf of the whole Church. It can also be celebrated communally at Mass or at special services. At Holy Martyrs Church, a communal celebration is held at weekend Masses twice a year. If you are seriously ill or before having surgery, you are encouraged to receive the sacrament of Anointing of the Sick. Please call the church office at 330.722.6633 to make arrangements.